Happy Tuesday everyone, I hope Monday treated you well! Today I want to introduce one of our newest sponsors that if you don't already know and love, you definitely WILL! 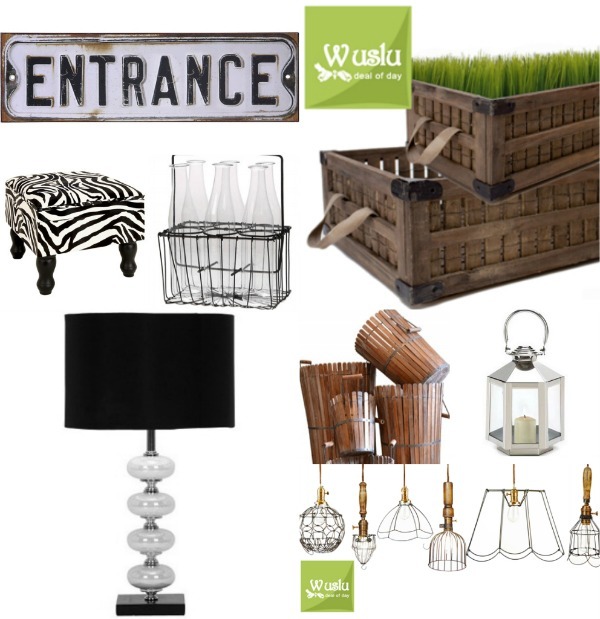 WUSLU is an exclusive online store that has ONE home decor daily deal EVERY day, starting at 10am. Their items are up to 85% off of retail prices, and not only are they ridiculously affordable, but incredibly adorable AND on trend. I'm kind of having a hard time telling everyone about them because more then once I've tried to purchase these fabulous deals, myself... and they have already sold out!!! gah! lol. Alright, so here are the kinds of things that you'll see on WUSLU.com. Great stuff, right!? I'm pretty sure I MUST have those mini glass bottles in that wire basket, and that ENTRANCE sign was yesterdays deal! So awesome for over a door somewhere, to give a cool vintage vibe. Anyway, you get the idea. WUSLU = great home decor, that won't break the bank. Ooooh! My husband does not thank you but I sure do! Love WUSLU! I have that wire bottle caddy and bottles in the pic above! Also have a set of wire baskets. Such great stuff!